“Life is a song--sing it. Life is a game–-play it. Life is a challenge--meet it. Life is a dream–-realize it. Life is a sacrifice–-offer it. Life is love–-enjoy it,” says Baba. When you think about life, do you take into account your future? 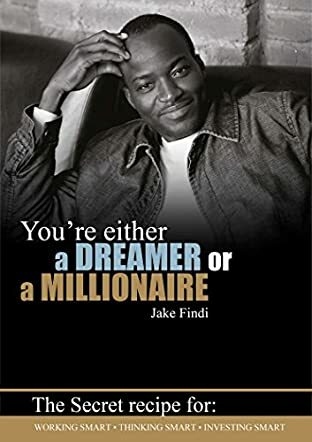 If you are seeking guidance to help you see your future differently, You're Either a Dreamer or a Millionaire by Jake Findi can help. Jake Findi provides some outlook on making a living, as the paths you take, and the financial decisions that you make now can greatly impact your future. As you navigate through each page of You're Either a Dreamer or a Millionaire, you will obtain not only solid principles but case studies to help you better understand how the principles can be applied. Once you gauge how the principles can be applied to your life, you can then use them to your benefit and put yourself in the driver's seat. As I read You're Either a Dreamer or a Millionaire by Jake Findi, I thought about the old adage of “work hard to succeed” but succeed in what? Success is relative to each person and it looks different for everyone. But the other old adage popped up in my mind of “working smarter, not harder” - this is closer to what Jake Findi brings to the table in You're Either a Dreamer or a Millionaire. Jake Findi shows the reader that it's the combination of various elements - from being prepared for opportunities and your mindset to investing not only your money but your time - that will bring you the financial security you seek.